"OK Seth, let me say this in the nicest way possible. Let's get going and only slow down for moose." We were parked outside the clinic's ER and had an unstable patient in the back of the ambulance. The EMS chief wanted me to know that there was no time for dawdling in this run. 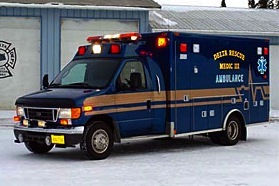 I flipped on the lights and notified dispatch we were beginning our 96 mile transport to the Fairbanks hospital. Saying a quick prayer for safety I stepped on the gas. As we sped along the highway at 90mph, the drive began to take more and more of my concentration. Usually on long transports I'm able to kick back my feet, so to speak, and enjoy the drive. But today, I had to stay focused. Dodging cars (two didn't pull over until I was on their bumper blasting the air horn) and slowing down to 80mph to make 50mph corners on all four wheels, there was not a second to think about much else. Yes I saw the sights along the highway but they didn't take as much of my attention as usual. I was focused, I was driven, I was concentrated. With sirens screaming and lights glittering, I pulled into the hospital an hour later with the patient still conscious and breathing. The experience made me think of another emergency run I'm on - one we're all on. Lives are in danger. There's no time to lose. We must remain focused and driven in order to reach our Heavenly destination safely. Satan's placed tons of distractions in our way, but unless we remain single minded we're going to be involved in an eternal accident. Definitely gives you a complete perspective of how we should devote ourselves more in order to be a messenger for someone else's ticket to salvation. Good stuff, keep it up and God bless you brother. Exciting, but Hey, if you're ever driving me, just remember that vehicle is not a Ferrari and it's more important to get there than to get there that fast (or else use a heli!) Be careful - never know when there could be a tire or other equipment failure. Very true! :) If I was ever driving you I'd be really careful. lol As we always say, "Their emergency doesn't necessitate our emergency." However if we can go faster, we do. And as for the equipment failure, things do happen and those are chances we take, but we try to keep up with the mechanics so we can catch things before something goes wrong.